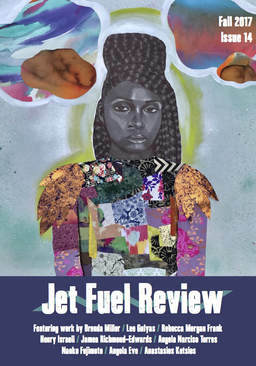 Jet Fuel Review accepts submissions for our Spring issue from January 15th to March 15th and our Fall Issue from August 15th to October 15th (or until we hit our max of submissions allowed on our Submittable plan). Please review our guidelines. If you are interested in submitting a book for potential review (fiction, creative nonfiction, or poetry), please send review copies to the address listed under "Submission Guidelines." You can check out our reviews here. Although housed at Lewis University, the content of Jet Fuel Review does not necessarily reflect the viewpoint of Lewis University as a whole. The University is not affiliated with, and is not responsible for, the contents of these pages. Issue 17 Coming Soon! With Cover Art by Artist Delano Dunn! 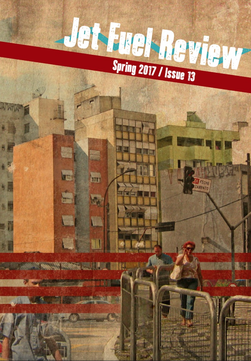 Be sure to check out our previous issues as well! I'd freeze the moment before you graduated. close to the edge, so i fear they may topple. motion and these soles have no friction. before it ashes in your eye.